Wandering is always a cause for concern with people who have Alzheimer’s or a related dementia. In the winter, wandering can be extremely dangerous for your loved one as they may not always dress appropriately and may become lost. * Secure the home of someone living with Alzheimer’s or related dementia. Install locks out of eye level view on doors and windows. You can also use motion detectors to alert you when your loved one opens the door. * Place a full-length mirror or stop sign on doors that you do not want your loved one with Alzheimer’s or dementia to enter. The image of another person can often stop someone with dementia. Also stop signs have been so imbedded in our memories that they can often still invoke the intended response. * Use signs with pictures on doors to help someone with Alzheimer’s or related dementia find the bathroom and their bedroom. These signs will aid in correctly identify where the doors lead and can help your loved one from accidentally leaving the house. * Have a fence installed with secured gates. This will allow your loved one to safely get some fresh air and enjoy the outdoors. * Get in the habit of taking walks together in the evening. Assuring your loved one with Alzheimer’s or related dementia is getting enough physical activity can help reduce their anxiety and restlessness. * Keep easy to eat snacks and water on hand and within view. Often those with Alzheimer’s and related dementia wander because they are looking for something, such as food or water. * Avoid noisy and busy places, such as the mall, that can cause anxiety for someone with Alzheimer’s or related dementia. Often they will try to walk to somewhere that is quieter and has less stimulation that can cause agitation. * Have a plan of action for if your loved one does wander off. Use a permanent marker or sew identification into their clothes with your contact information. Keep a recent photo and medical information on hand to share with police and other authorities who will be helping you search for your loved one. 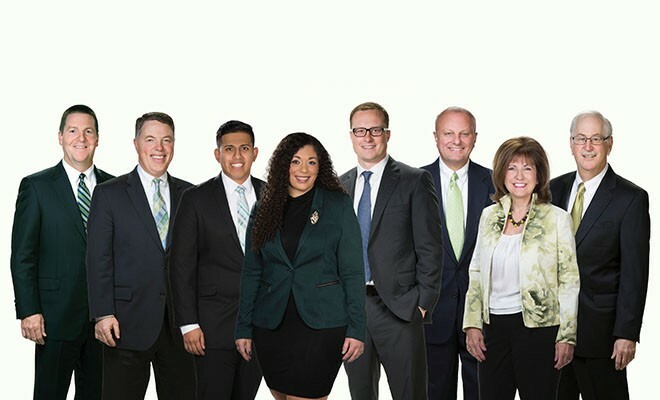 You can also look into joining a program that can help you track your loved one with GPS. These often require a monthly subscription fee. 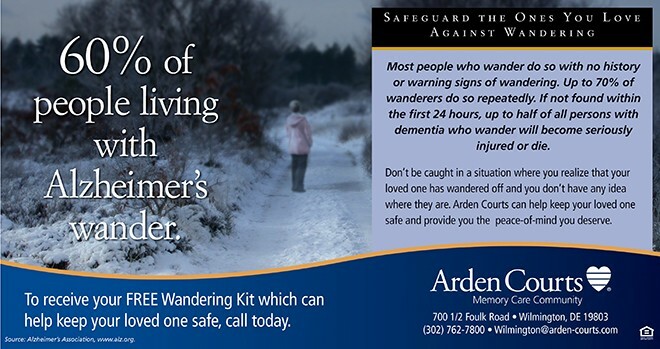 To receive your FREE Winter Wandering Kit to help keep your loved one safe this winter, call Arden Courts of Wilmington at (302) 762-7800 or e-mail Wilmington@arden-courts.com. ← Previous Story Let Us Give You Something To Smile About!